Black Dragon Pool (also Heilongtan), or Jade Spring(Yuquan) Park is the main headwater of the Yushui River which goes through the Old Town. The springs come from the god-protected mountains and gather in this place and finally form the dragon pool. Black Dragon Pool (also Heilongtan), or Jade Spring(Yuquan) Park is the main headwater of the Yushui River which goes through the Old Town. People believe that the gods of the Naxi people are living in the chestnut woods, beside the mouth of springs, behind the carved doors and below the bridges. The springs come from the god-protected mountains and gather in this place and finally form the dragon pool. Then water goes down a waterfall and becomes the Yuhe River, pouring life to the Old Town. The Black Dragon Pool is like an ancient architecture museum. Some of the famous buildings were established suburbs have under protection actually collected from other places. People moved the traditional buildings that almost had been ruined here and let them be protected. Among them, the most famous buildings are the Villa Jietuolin of the King Mu and the Five Phoenixes Tower combines the typical Lamaism plane pattern and exquisite wooden structure of the Naxi architecture. Both the frame and the technology are unprecedented. The buildings can rarely be found even in the world of Chinese architecture. The Black Dragon Pool’s distinguishing feature caters to the habituation of the Naxi who loves nature very much. In the past, it was a good choice for people form the Old Town to go picnicking. They gave themselves a good reason for picnic when they came to thank the blessing of the gods. They took all kinds of delicious food, wine and their specially made hotpot here and gathered together to enjoy the happy and relaxing life. Now Black Dragon Pool buildings are divided into up and down two Taoist temples. Down temple “Black Dragon Palace”, which was said that built in 1454, was a type of building with one hall with two enclosed courtyards. Outer courtyard had a censer, engraved with eight diagrams, on both sides are the big dipper figure, these are the Taoism used to ward off evil spirits. In the inner courtyard patio pool there is a vivid paddled black dragon carving. 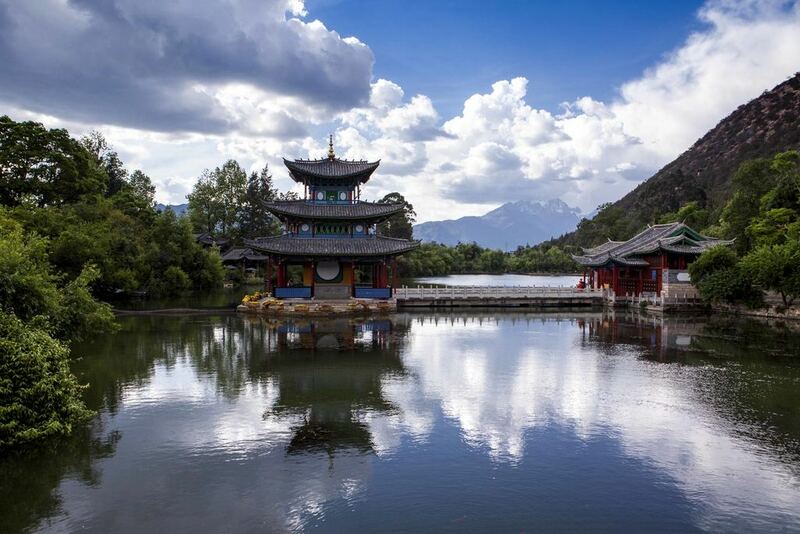 Legend has it that it is the Du Dragon King in charge of Yunnan clouds and rainfalls. The Black Dragon Pool takes its name from an ancient legend. It’s said that once upon a time there were ten evil dragons that terrorised the land. Lu Dongbin, one of the Eight Immortals of Chinese legends, jailed nine of the dragons in a tower, leaving only the youngest black dragon. The black dragon was forced to protect the land to keep its freedom, and still lives in the pool today. The Black Dragon Pool is divided into two parts by a white marble bridge, and despite the water being connected, the sides maintain different colours and the fish on either side refuse to swim to the opposite pool. Additionally, Black Dragon Pool has never dried up, even during the worst droughts. take bus no. 3, 4, 6, 7, 8 or 9, and get off at Heilongtan Station. 15 minutes’ walking from the Old Town of Lijiang or taking a taxi. Taxi fare is around CNY 10 to 15. It is free to get into but travelers should show the receipt of Mantenance Fee for Lijiang Old Town. While it will open after 7:00 pm and close before 9:30.